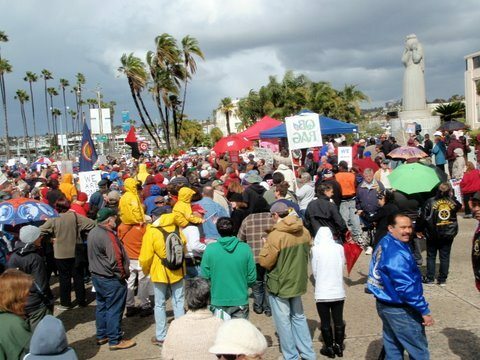 Over one thousand San Diegans – mainly of them union members – rallied today, Sat, Feb 26th, in the rain in support of Wisconsin working people. Under dark gray clouds, and in front of the County Admin Building, representing every union in the County, San Diego labor flexed its muscle today in a show of solidarity with the demonstrators in Madison. It was largely expressed during the event by speakers, signs, and chants that Wisconsin Gov. Scott Walker’s assault on collective bargaining and other union rights of public employees was a war on working people and unions in general, and that San Diego – often considered a non-union town – was standing up in support of them. Many community groups were present also, and as the rain swept through the crowd, the crowd held its ground as hundreds of umbrellas quickly emerged and were thrown up instantly as if on cue. It was a very mixed crowd that gathered, many wearing red jackets or shirts as a sign of solidarity with Wisconsin. Young, old, white and people of color, men and women of all ages and groups mingled together on the sidewalk and in front of the fountain on the bayside of the large, looming County building behind the crowd. One speaker later pointed out that the building had been build by the Depression-era WPA in 1936. Lorena Gonzalez, the Secretary-Treasurer of the San Diego County Labor Council, opened up the event and introduced speaker after speaker, each represented a union and each of whom was heartily welcomed. Spontaneous chants broke out, including the theme of the rally, “we are one.” Gov. Walker and the billionaire Koch brothers were routinely booed whenever theirs names came up. Firefighters were there, carpenters, Teamsters, social workers, plumbers, secretaries, electricians, nurses, teachers, city workers, service workers, janitors, laborers, homecare workers, librarians, para-medics – you know the people that make society run, who provide the services for us, and make government function. The general themes of the speakers were repeated throughout the early afternoon demonstration, that Wisconsin Gov. Walker’s assault was not about that state’s budget, that he was broadly attacking public unions’ rights, hence the rights of all unions. Many speakers equated that to an attack on San Diegans and Americans in general. Many speakers declared that the anti-union attack in Wisconsin – and other states like Ohio, Indiana, New Jersey – was an attack on the American dream, the middle class, and ordinary Americans. Rally in support of Wisconsin, 2/26/11. Photo: Doug Porter. Demonstrators were also hugging both sides of Harbor Drive, waving signs to cars passing by. Every once in a while a large tractor trailer rolled by, honking loudly, with the word “Teamster” on its side. Speakers representing nurses, teachers, and unions such as AFSCME all cited the need for unions, their positive role in society, especially as a bulwark against the very rich, the huge corporations, their PACs and politicians who do their dirty work, like Gov. Walker and the other GOP governors pushing radical right agendas. A number of elected officials were on hand and a few of them spoke, including State legislators Juan Vargas, Toni Atkins, and Ben Hueso, and San Diego School Board president Richard Barrera. At one point Lorena Gonzalez said that there is a lot of corporate media in this town, but there are some independent media including blogs that supports labor and progressives – and that one such blog was the OB Rag which, she said, helped to organize the event. As Mother Nature exhibited all of her treasures – the sun would break out, followed by another drenching, and then wind, the crowd hung in there, as community groups like MoveOn, Progressive Democrats of America, the Green Party all gave endorsements. Finally, the crowd had dwindled by a little after 2pm, but a statement had been made, that even in San Diego labor and its allies will stand up in a strong sign of support for those in Wisconsin. i loved the OB Rag banner. thanks to Patty for making that, and somehow keeping it aloft in the wind. anybody wanna bet the UT doesn’t cover it Sunday? Well, if they do cover it, they will say that there were “dozens” of people attending the rally. …and that the protesters were bussed in by the unions from Wisconsin…. Patty- great OBRag Flag! Frank- great rallying cry! 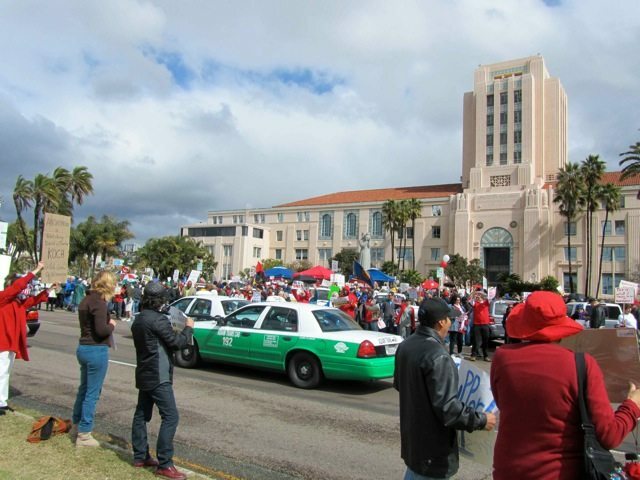 Did you see any coverage at all of yesterday’s rally at the U-T or SignOnSD? I haven’t . Not a thing reported in the local rag. Lovely to know how they censor real news! I’d love to see a picture of that great OBRag banner . . . and thank you all for being there and doing that!! Dickie, watch Shane’s vid – it’s there in the first few moments. Disabled workers were there too, in Solidarity ! Anarcho-Syndicalist flag that was more than happy to explain what it stood for…. Mar, yeah, I remember seeing you while I was up on the stage. I think I know what the flag stood for – thanks for coming out. Public unions should have very limited collective bargaining rights, because, they are on both sides of the table. Then the people that have to pay for whatever they agree to, ie the taxpayer, don’t get a say in the manner unless it goes to the polls. Not very fair, and then the unions buy the politicians, and it is just a big vicious circle……. What have the US Chamber of Commerce, Exxon, Bank of America and Koch Industries done for you today? I don’t expect them to do anything for me. That’s the problem with unions and left-leaning people: alwauys in line for a hand-out. Do something for yourself…..
i see i touched a nerve in your open hand….. So cahlo, you live out in the desert in a shack you built yourself out of wood you cut yourself with no running water, electricity, roads, etc? If you can’t answer yes to this, then you are taking help from the public good. Mostly supplied by union people. Let’s see, five or six local elected officials spoke to a crowd engaged in peaceful protest. The Sunday UT runs a news service report on demonstrations in other cities, but nary a mention of San Diego. Yet an earlier article (Friday) included a picture from a tea party rally that didn’t attract more than 50 people. Proof positive that things at the UT haven’t changed one bit. Doug Porter is so right about this, that it geared us up to launch a letter-writing campaign to the U-T (see new post). Only local coverage I’ve seen so far is Ch 10 News here. Can somebody verify if MEA was “officially” there? We heard from AFSCME and those of us who are MEA members were waiting for an MEA speaker. No, annagrace, after carefully examining Shane’s video, I can now see that the guy who I thought was from MEA speaking was actually from AFSCME. Sorry about that – I corrected the text above. The Labor Council was in control of the speakers and the agenda. It was their tents, sound system, signs, permit, insurance, and finally their connections that allowed the event to be held. There was an open mike at the end, and any MEA rep could have spoke. That’s when Gregg Robinson, Hugh Moore, me and Monty and others got up and declared our support. It was a little disappointing in the end when most (not all) of the Union reps and politicians left, but at least time was afforded to further speakers…, as far as Cahlo “alwauys in line for a hand-out.” Why is it that right wing trolls can never, ever, ever, spell anything correctly? ROFL! And guys there have been quite a few additional videos of the rally posted on youtube in the last 36 hours, check ’em out. One additional comment: In the past 3 years I have been involved in numerous actions in and around San Diego that warranted news coverage, about a third of those actions having been documented by news agencies around town, but not once did any of it actually make the news…so in my eyes it’s fair to say that it’s not just the UT but all of S.D.’s news culture that deems anything from the left to be unworthy of coverage. As patrons and customers we should collectively challenge not only the UT but all the others as well. 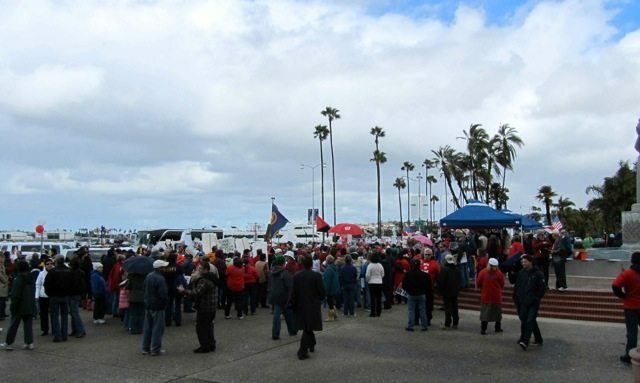 We had a rally to Save the American Dream in all 50 states on Feb. 26 2011 and over 1000 union people showed up at the County complex in San Diego in the rain to support our fellow brothers and sisters in Wisconsin. With the vote to fund federal budget coming March 18th we are holding another rally in conjunction with rallies going on in all fifty states on march 15th. We need to spread the word in short order to get as many people out as possible. This is to show the congressional republican’s they are not to cut funding on the backs of working people and cut essential funding for poor and elderly Americans. It cost $1000 dollars to pay for a permit and to have the rally at the county complex in San Diego and I would hope to get $100 dollars from every local union in San Diego from your C.O.P.E funds if that is possible. I would also like to have each Business Agent speak to our cause and to rally all members to show up for America. This is of the most important times of our lives as they are trying to do away with the middle class and do away with collective bargaining.